"The RIght Time" For this amazing clock! I use it to keep all the others accurate. I had a wall clock originally that only told the time. This one is 3 times better. I love this clock . Have gotten it a few years ago and never had any trouble. So ordered another one. Have this by my chair in living room. Directions for how to set are not clear. Had to play around with it before I figured it out. Going from pacific to eastern time the hardest thing to do. Bought for my mother so she can see it and numbers are large enough for that. Will only show Pacific time,.... I'm on East Coast - Bummer! I want to return the clock, - and hope you'll send one that you've tested - that shows EASTERN time. Every morning when I wake up - the clock is 3 hours behind! - Otherwise it's great! Not a good buy !!! Haven't received a working clock yet. First clock arrived in pieces! Replacement doesn't work! Tried different batteries and help from friends but face showed jumbled characters. I REALLY want THIS clock so you are sending me a 3rd try. If that no good then I GIVE UP! The first one I ordered was broken. When I took it out of the box something rattled around inside. I put batteries in and you could not read the whole display. I called and they replaced it. I got the new one today. Guess what? You cannot read the whole display unless you hold it upside down. I will be returning it for a refund. The clock is just as advertised. It has a large white face and black numbers. Perfect for old eyes. Looking for wall clocks that display both time and date. Lage clocks so info is easily accessible. Maintain consistency times during time changes and have large and easy to read numbers. I needed a new one. Wanted an Atomic clock instead of a generic clock that has to be manually set. I need this wall clock for work. I like that it has the time, temperature, the date and day of the week. Large, easy to see display, and reasonably priced. I love having all that information at a glance. I love it. Have one and love it. I saw the size of the numbers on this clock and that it was atomic, I had to have it. I need a clock in my living room, besides my grandfather and cuckoo clocks which are not viewable from my chair! This clock had best belie the negative reviews....I'm going out on a limb, here. Have liked in the past. Like the combined info & self changing for time. replacing my old one and wanted one with date. Because I needed a new alarm clock & wanted to be able to see it easily. My sight's imperfect, so the high contrast giant numerals will be visible at night. Does this clock glow in the dark? BEST ANSWER: No it doesn't. I wish it did. I thought it did when I purchased it. As a result, it's in my office and not in my bedroom where I had intended to use it. Thank you for your question. 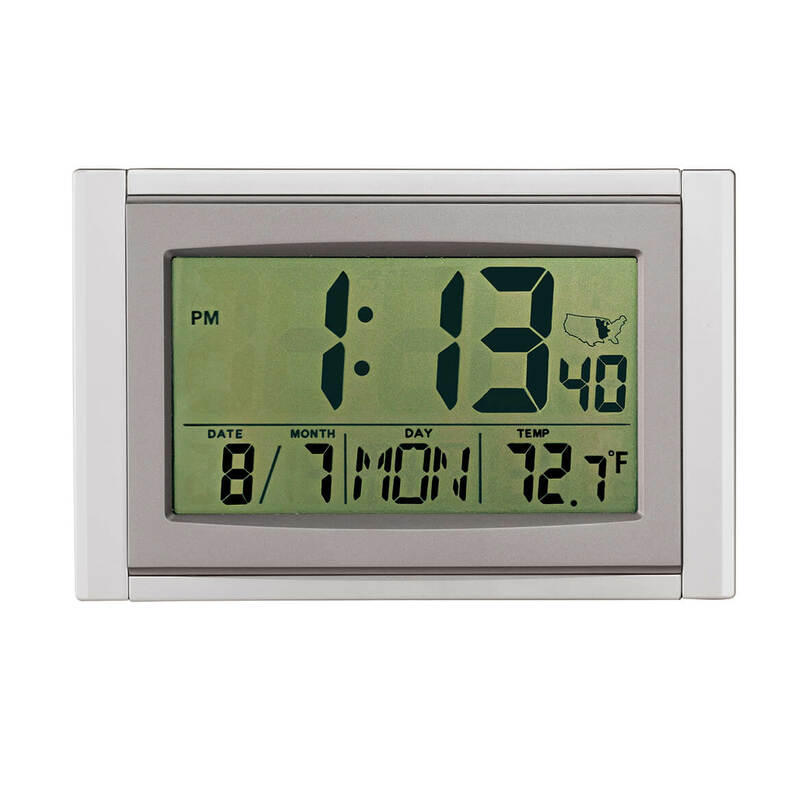 The Large LCD Atomic Clock does not glow in the dark. We hope this information will be of help to you. Unfortunately no, that is why we returned it. No, it does not glow in the dark. BEST ANSWER: There should be an instruction sheet with the clock. Under the KEY INSTRUCTION section of this instruction sheet, setting the Time Zone is shown under Item 4 in this section. According to the instructions, pressing the UP key will shift the time zone between Pacific, Mountain, Central and Eastern. Thank you for your question. Please check your email we have sent you an email with the instructions attached. We hope this information will be of help to you. how to set it at the mountain daylight savings time for the first time? BEST ANSWER: Thank you for your question. It should automatically set itself for daylight savings. It may take a day or two to set. If not, please make sure it has a proper RCC signal. If it still is not resenting try placing my a window for better connection. We hope this information will be of help to you. Does this clock come on a smaller size? BEST ANSWER: Thank you for your question. Unfortunately this item is one size only. We hope this information will be of help to you.